VISHAY Intertechnology, represented in Australia by Braemac , has announced the release of a new 0.25W surface-mount “power metal strip” resistor. The resistor has a power rating that matches that of larger 1206 size resistors while offering superior overload and pulse-handling capability. The new WSE0805 resistor is the industry's first device to combine a 0.25W rating and a resistance range of 10Ω to 10,000Ω in the very small 0805 package. The package measures 2.30 mm by 1.27 mm with a maximum height of 0.64 mm. 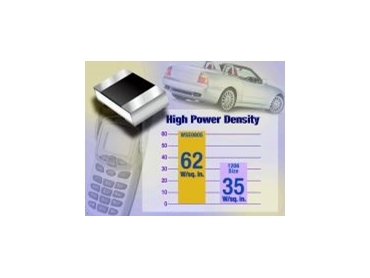 The component may therefore be used in lieu of larger components with equivalent power capability, saving board space and enabling the design of smaller and lighter consumer products. With its high power rating, the WSE0805 is also suitable for replacing low-power leaded wirewound resistors. Typical applications for the WSE0805 resistor include voltage amplifier circuits, precision voltage divider circuits, and high-frequency circuits in telecommunications, automotive, industrial instrumentation, consumer electronics, and computing systems. The new resistor from Vishay features a low TCR of 15 ppm/°C, a resistance range from 10Ω; to 10,000Ω;, and tight tolerance down to 0.1%, as well as low noise of <-40db, very low inductance of <0.08 µH, and a voltage coefficient of <0.1 ppm/V. It is rated for an operating temperature range of -65°C to +150°C and provides resistance to thermal shock, moisture, and high-temperature bonding exposure.